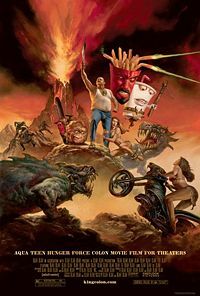 So today I'm faced with the dilemma of reviewing "Aqua Teen Hunger Force Colon Movie Film For Theaters," which is about as "over my head" of a movie I'm ever going to review. Even Pokemon would be easier to explain then to an everyday person then this ever would be. But I digress, some things you just take in stride. 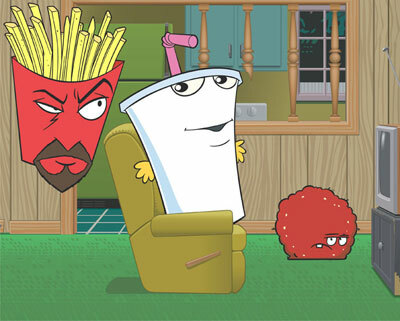 So, "Aqua Teen Hunger Force Colon Movie Film For Theaters" (and yes, being the trooper I am, I'm going to be calling the movie by it's full name during the whole review) is about a box of french fries, a ball of transforming meet, a milkshake, and a chicken that catches on fire. There's also some subplot about a ex-cop named Carl who has a nice pair of pants, but I think I may have already lost you. Now for the real fun: While these characters have names and things to do, you must ultimately go into this movie expecting nothing. This movie has too little patience to bother itself with a coherent story, plausible characters, or...well, plausible anything. I'm sorry guys, but what do you want me to do? I'm sitting here in this movie, watching a movie where a ball of meat is playing a guitar while shooting kittens out of a canon, and my pen and notepad aren't moving. I know I should be writing key scenes in this movie down, making notes on all the bizarre stuff that happens in this film, but I just don't know how. Where do I start? How do I even make a note. I make a note about a prophetic robot that likes to hump metal down, and I look at my notes and question whether I really saw that? Then halfway through the movie, I get frustrated with how many times Phil Collins "In The Air Tonight" starts playing, but alas, this movie doesn't have enough of a budget to play the song long enough for us to hear Phil sing. At one point one of the characters says "we know you didn't come see this movie with a date." I think to myself "no kidding. Taking a girlfriend to this movie would be grounds for a divorce before anyone even got married." Ah, but I did laugh. Laugh I did. God, listen to me, this review is starting to sound like Shakespear compared to this movie's script. 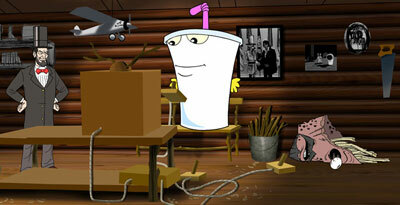 I'm looking at the words I write, trying to find a way to explain my favorite scene without looking like a moron. Well, since this most likely can't be done, I'll just say it outright: My favorite scene is the scene where the fly raps. And the chicken that's on fire. I've seen a few of the cartoons on Cartoon Network, but I think this movie suffers from the SNL syndrome where what works as a five minute skit feels like a stretch when you make it into a movie. True to the TV show, there are many great five minute scenes that are hilarious despite my attempts to make any sense come from them. But for every five minutes of brilliance there is ten minutes of slowness. The climax of this movie is...well it's about seven and a half minutes long. I think that this movie will actually have more success on YouTube, where people can watch the five minute sections of the movie that are truly good, and leave the rest on the cutting room floor. Heck, some of the later scenes might even turn out to be funny once you cut out an hour of sitting through the movie. Yes, I'm in way over my head with this movie. I enjoyed many parts, but I didn't enjoy them all at once. And the most damning thing about this movie? It's so confusing, so lacking in logic and structure, that this terrible review STILL makes more sense then this movie does! 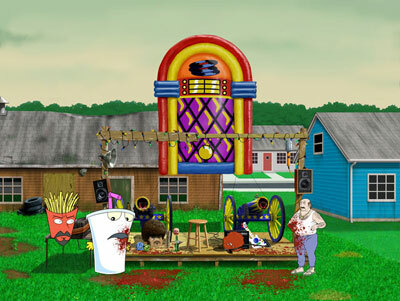 Somehow, I think this may be "Aqua Teen Hunger Force Colon Movie Film For Theaters" biggest accomplishment. Parents should keep their kids away from this movie. Though some of the colorful language is bleeped out many words make it through uncensored, followed by lots of random crude and sexual content. Recommended for ages 17 and up.